James Farley, Griswold's product manager, discusses a pump’s best efficiency point in the company's latest vlog. Centrifugal pump manufacturer, Griswold, recently released a new vlog in its Centrifugal Pump Minute educational video blog series. The video blog series covers all things related to centrifugal pumps, and is sponsored by Griswold, a PSG Dover company, and specialists in this technology. 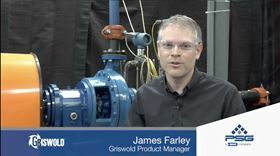 The latest video is entitled Operating at Best Efficiency Point and James Farley, Griswold product manager, discusses a pump’s best efficiency point and a good target for efficient pump operation. Using the Griswold test lab, he shows what factors affect pump efficiency, and how to optimise the performance of your pump. You can view the video here.